I don't recall it ever falling below $100 TBH. 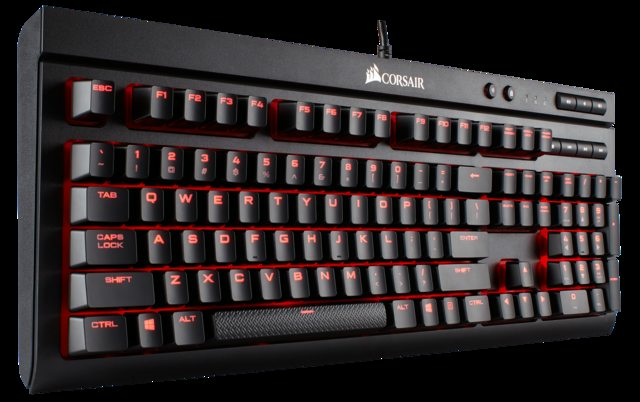 Corsairs seem to have a less than stellar rep (among the geeks anyway), due to the fact that the bottom row of the keyboard is "non-standard", so you can't replace the keycaps easily if that's something you want to do. Chances of me doing that in any big way are real small. I just want something better than this Logitech K520 the office gave me. Are there better options in the sub-$100 range? Sub $100 keyboards with cherry browns? ooh I found a Strafe. Heh, that Strafe is the one I've got bookmarked. Just trying to decide if I want to drop the money on it. Edit: Well, that was easy. Corsair has refurbished Strafes in various switch flavors available on their site for $50 plus $5 shipping. Ordered! I have a Rosewill with browns at work. It's lasted almost three years now, and hasn't really shown any signs of wear. I wanted browns, plus something that didn't look gamer-y in a professional setting. It's easily surpassed my expectations, and I have no problem recommending it. Ended up caving and picked this up for $25.00. It is louder than I would like but it the feel is perfect. I think i'm going to pick up some dampeners and quiet it up a bit, but overall for $25 on sale it was a great buy. Here's a somewhat obsessive guide to switch types. Click through to see other switches and manufacturers and click through again for even more detail on each switch. So I've been using the Mistel Barocco split mechanical at home for a week or so now. I'm really enjoying it. Seems like the keys can be a little tricky to press at times, but that may be due in part to me using it in a "captain's chair" layout (I'm in a recliner, fully reclined, the two halves are on the armrests, the right half is slightly too big for the armrest and the armrests have some padding so I probably have to apply more force than usual to the keys). The switches appear to be genuine Cherry Blues, as far as I can tell (which was pulling off a keycap and seeing the Cherry name and logo on the switch). It's a compact keyboard too, which is something I'm really not used to but I could grow to like (if you're familiar with the Vortex Pok3r, it's like one of those broken in half, has different layers and macros and there are RGB models and whatnot). The cable that comes with the keyboard to connect the two halves is kind of short though if you want to stretch the halves farther apart, and it's frustrating trying to find a really long Micro USB male to Micro USB male cable anywhere. They do say you can use the right half by itself to emulate a full keyboard using the different programmable layers (no idea how that would actually work though). For the true split keyboard enthusiast, one disadvantage is that it doesn't have wrist rests or "tenting" capabilities, you'd have to improvise (i.e. - stick a book or a towel underneath). I think they have a model with Cherry Clears that I might use to replace my work keyboard (Das Professional 4 with Browns, nothing wrong with it but I type hard), but I want to try out a keyboard with Clear switches first (which puts me in something of an awkward ouroboros of logic: why not just get the Barocco with Clears and skip the intermediate?). Random aside: I bought some blue o-rings to use on my current work keyboard, to see if that would make them feel better/less noisy. I thought I noticed the tactile bump of the Brown switch was more pronounced with an o-ring, too. When I put the rings on, though, for some of the keys it didn't feel like the ring was doing anything at all in terms of noise or actuation. I don't know if it's the particular keycaps or if I'm still typing too hard, because I could see in some cases the ring got pushed all the way up the stem of the keycap, and I'm not sure if they're supposed to go up that far or if that should matter in the first place. If anyone has insight I would appreciate it. It's furthering my resolve to try to find a work keyboard with Clears, although a cubicle neighbor just got the WASD Code White with Clears and I feel like getting the same style as him would be incredibly dorky. Just got my Corsair Strafe with browns in last night. It was a refurb, so it was less surprising when I noticed it looked weird because the F and G keys were swapped. Fortunately, they included a key puller, so I fixed that. It's not nearly as loud as I thought it'd be. I'm probably whacking the keys too hard, because I'm definitely bottoming out, but maybe I'll get better. My problem now is that I totally need a wrist wrest. Any suggestions, or just grab one of the generic cheapo ones from Amazon? I generally do not recommend a wrist rest for proper typing technique. Or at least look for a really tall one to make your wrists straight to combat fatigue/sores. Iirc putting your wrist down on the desk/rest is fine while resting. Wrists come up while you're actively typing. Cool, thanks. 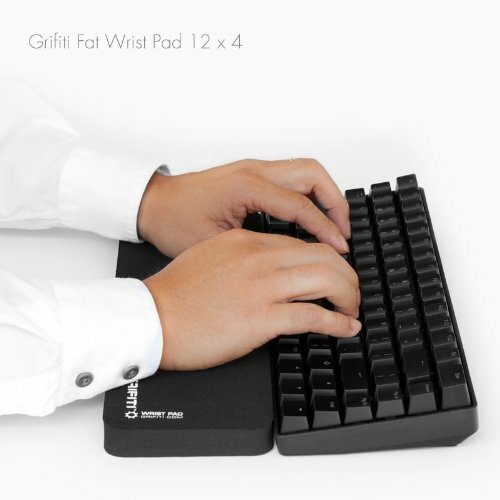 I have an adjustable standing desk, and I dropped it a few inches, which makes it easier to float my wrists when typing, but I'll probably pick up one of those Grifiti pads. Man, I'm already feeling the need for new keycaps. The ones on here don't have a very prominent nub on the F and J keys, so finding home row is harder than I'd like. I want textured keys for those! Anyone have a line on some decent cyrillic AND latin keycaps? For less than 200 bucks omg I don't want it that bad. I'd say it'll be around $110 at lowest. Those look dope man, but unfortunately is a cyrillic OR latin kit. Topres are basically the best rubber dome keyboards you'll ever encounter. When you first get one, they feel mushy and awful, like pretty much every rubber dome. But over about a month, the domes break in, and the springs underneath start to take more of the load. It gradually becomes an exceptionally comfortable board for typing. It's particularly good for serious word production; the softened landing and slight rebound adds up, over time. After about a half an hour, I start to notice that my fingers feel unusually good, where they typically hurt just the tiniest, tiniest bit in regular typing on a Cherry or buckling spring keyboard. They're just a little bit uncomfortable, not something I really notice until it's not there, and it mostly vanishes with the Topres. The biggest downside I see is that the keys register at the bottom of the stroke, instead of the top. This makes them slower to respond, which can potentially matter in high-speed games. Noise level is really outstanding. They make this very, very quiet 'thwock' sound once they've broken in. It's a very comfortable sort of sound, kind of friendly, if that makes any sense at all. Cherries are a bit noisy and clacky, even the ones without a click; you don't get much of that high frequency rattle on a Topre. As a tl;dr, I'd say that Topres are one of the better choices for working, for actually churning out a bunch of text. You can use them for gaming, like you can use any keyboard, but they're not as good as a Cherry for that. A few weeks ago I finally got frustrated enough with the few semi-functional keys on my Razer Black Widow and bought a Corsair K70 with Cherry MX "Speed" switches. These are not-very-clicky, super sensitive switches that require only a very light touch. It took a while to get used to them, and during that period I was worried that the very light touch was just too light. I kept activating keys accidentally by barely resting my fingers on them. However, now that I'm used to them, they're just amazing. The literature on the Cherry MX Speed switches says they have no tactile feedback, but I feel *something* using them. They're a very different feel from the other mechanical switches I've used - Blues in my original Black Widow, before Razer started outsourcing switches to a Chinese manufacturer, and then those super-unreliable Chinese switches in the other Black Widow keyboards I bought (like an idiot). The K70 is pretty awesome. One of the best features I like about it is the way the switches are installed in the keyboard leaves a flat surface under the keys which is super easy to clean. There's no "keyboard well" to collect detritus like pretty much every other keyboard I've seen. The K70 has a few flaws: the secondary labels (punctuation &c.) are very poorly lit, as are the media keys. I love that it has separate buttons to control brightness and disable windows keys (which ones are configurable in the software), but their lighting is not configurable, and they are VERY bright. 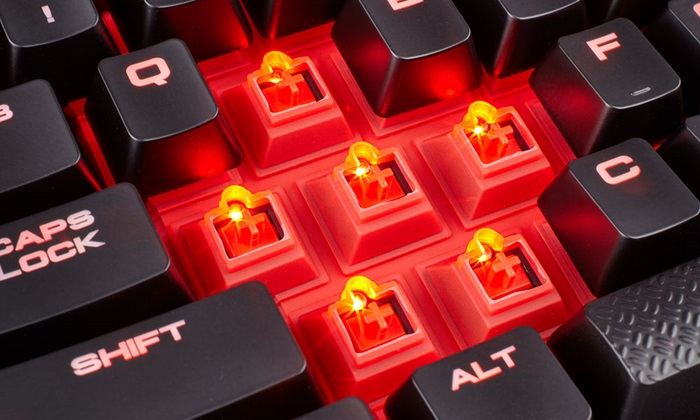 The caps, num lock and scroll lock indicators are blinding white LEDs also. Fortunately, LightDims are a great solution to that, and they are very reasonably priced. If you're a super cheapskate, howtogeek has a DIY article on making your own LED dimmers. Well, this turned into a huge ramble, sorry. I mostly just wanted to point out that the feel of the Cherry "Speed" switches is very good. Currently only available on Corsair keyboards, though. It has an form factor identical to the K70. The only apparent difference is the rubber shields around the key switches. I guess if mine ever dies I will be getting one that is spill proof. I need one that is dog hair proof. I've had dog fur get up and under and into the mechanical part of my K70 and had to take it apart. It was so messed up keys weren't registering or were double registering. It was like a webbing holding them in place. I need to either cut down his gaming sessions or teach him to use a keypuller. Not quite as bulletproof as a Topre, but at least to a quick glance, that looks like an excellent idea. I wonder if it'll change the key feel very much? On Reds, it probably wouldn't make any difference for usability (since Reds actuate at almost the top of the keystroke), but the feel could be a fair bit different if the keys are hitting the rubber on the bottom. Might be better, actually. Your dog must shed a LOT! We get cat hairs in all corners of the house but I don't think it ever gets in my keyboard. Everyone calls him snowglobe. When he shakes it's like a winter wonderland. Yes he gets brushed, but he's 90 lbs and has allergies. The fur will fly almost to the ceiling. Vacuum is full every day and has to be taken apart every 3 days. Dog fur under the mouse is also a big issue for the tracking sensor. I broke. I bought the G Pro. I love it. I had gotten used to the steel backplate on the CODE keyboard and I just had to have it. Still love the Romer-G switches for a gaming keyboard, and this feels much sturdier than the G410. Plus, of course, all the weird plastic appendages gone. I did the same a while back too actually, just opted to not embarrass myself in the moment by admitting I now have yet another keyboard. Still using a magicforce 68 key on my server PC, just now with the much better looking, sounding, and feeling G Pro on the gaming system. It's OK, this is a no-judgement zone.